Sometimes referred to as the "cat owl" these owls actually do not have long ears at all. What look like ears are, horn like, tufts of feather on top of their head. They are also recognizable by their orange eyes surrounded by a round, buff colored, facial disk. 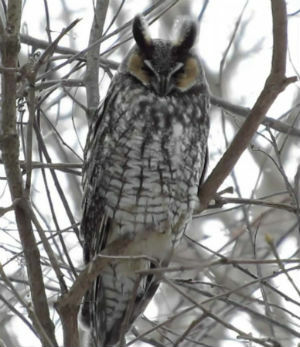 They resemble the Great Horned Owl but are smaller at only 13-16 inches tall, with a 3 foot wingspan. Males are whitish-gray with dark brown streaking and barring. Females tend to have more dark brown than males. Although they can be found all across New York and are fairly common, they are rarely seen by most people. They hunt mainly at night for small mammals like mice, voles, screw and small rabbits with an occasional small bird or reptile. They swoop down, flying low and kill their prey on the ground, usually biting them on the head. Like other owls they do not chew their food but swallow it whole, then regurgitate the bones and hair in the form of pellets later. Males will begin their search for a mate as early as January, using songs and aerial displays to attract a female. Primarily monogamous, couples will begin breeding between February and July, often occupying nests previously built and abandoned by other large birds. Although they will occasional nest in a hollowed out tree stump. Females will lay between 5 - 7 eggs, which incubate in 4 weeks. The hatchlings are able to leave the nest in about 3 weeks and begin to fly after 35 days, but will stay with the family for a couple more months after fledging. Young birds can begin breeding one year after birth. It can hunt in complete darkness. It's left ear opening is set higher than the right making the owl able to locate prey strictly by sound. Its common call is a long, single "whooo" or a series of "whooo-whooo-whooo." It flies with its ear tufts layed back against its head. The hoot of the male can sometimes be heard up to 3/4 miles away. From tiny Elf and Pygmy Owls through the familiar Tawny and Barn Owls to the giant Eagle and Fish Owls, these fierce hunters of dawn, dusk and night have long held a fascination for people around the world. 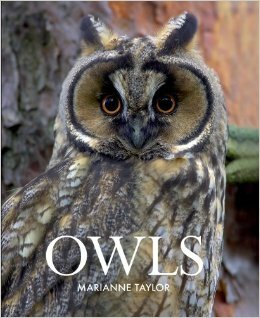 This informative book, covering all owl species found in the northern hemisphere, looks closely at how owls live their lives, and how best to recognize them.